Have you been wondering what wheel dimensions your car or truck? Look no further than this site. 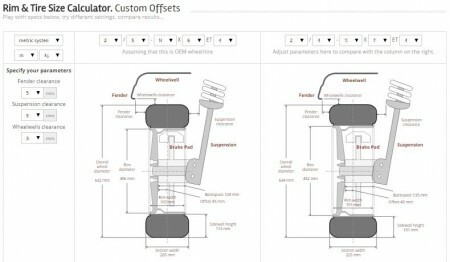 Wheel-size.com claims to have over 2,000 total vehicles with specs that include offset by wheel size, centerbore and even bolt hole diameter. Maybe your vehicle is a little more obscure than some of the common fitments — the high-offset 5x120mm wheels that, with spacers, can fit nearly all 5-bolt BMWs, for example. 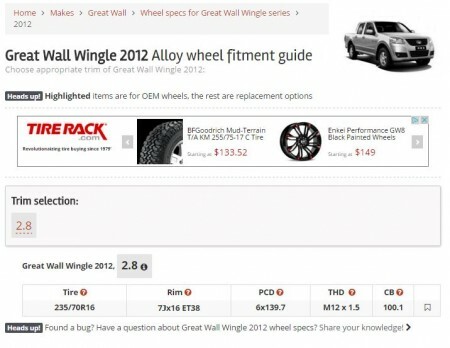 Maybe you looking to put some off-road tires and wheels on your 2012 Great Wall Wingle and the local tire shop can’t help? In addition, for some vehicles, you have added the ability to preview different wheels on your car (Wheel Configuator). But, it is quite limited — I was really hoping to see some options for the Wingle. And, likely of interest to those building one-off, crazy Lamborghini rally cars, they have a nice Rim and Tire Size Calculator, as well. 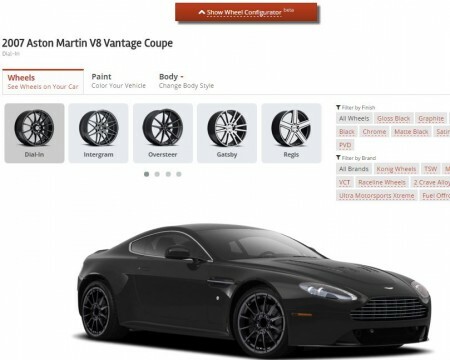 If you know some basic parameters you can digitally dial-in what you would need for a custom set of rims, for example.